Using commercial vacuum flanges in ASME Section VIII Division 1 Code stamped vessels - Meyer Tool & Mfg. 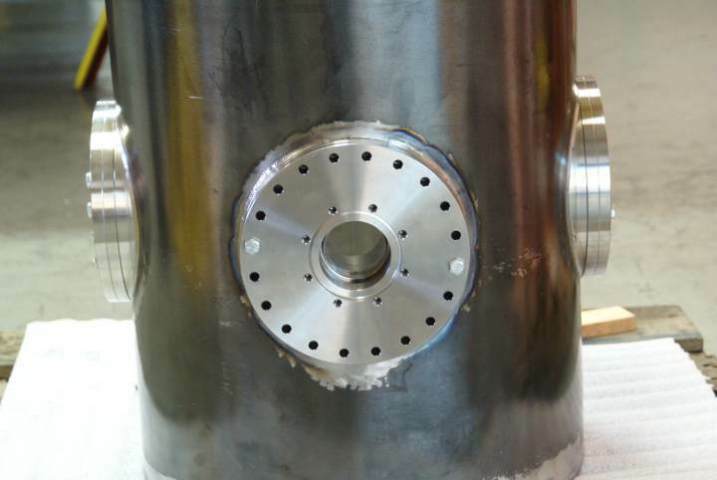 Conflat type compatible flanges are widely used in vacuum systems and have also been used in scientific equipment for handling liquefied and pressurized gases. The knife-edge sealing system offers a high degree of seal integrity over a wide temperature range. In many instances it would be desirable to use a commercial conflat vacuum flange on an ASME Code stamped pressure vessel. The first obstacle to overcome will be the question of material and material traceability. Paragraph UG-4 requires that material under stress due to pressure be a material listed in Section II Part D of the code. This is demonstrated by supplying a Mill Test Report (MTR) which certifies that the material meets one of the required ASME specifications. There are exceptions to this requirement; including those provided in UG-11: Prefabricated or Preformed Pressure Parts. Unfortunately the only standard pressure parts which may be used without being accompanied by material certifications are those which comply with an ASME standard or a Manufacturer’s Standard and are marked accordingly. These markings must constitute the manufacturer's certification that the material and the standard are suitable for service at the rating indicated. No such ASME or Manufacturer’s Standard exists for conflat type compatible flanges; they do not have a pressure rating. A few manufacturers are now offering material certifications for conflat type flanges. The flanges are numbered to provide for traceability. The only other option would be to purchase a piece of material with an MTR and to machine a conflat type flange from that material. However, that approach would not offer the convenience of a commercial flange. Assuming that we have secured an MTR for a conflat type flange, what would be necessary to demonstrate that it meets code requirements? ASME Code Section VIII Division 1 Paragraph UG-34, “Unstayed Flat Heads and Covers” sets out the general requirements for Flange Covers, while Appendix 2: “Rules for Bolted Flange Connections with Ring Type Gaskets” does so for flanges. The Appendix 2 rules governing the design of flanges are rather complex. Leaving the details for a pressure vessel design course, it can be stated that when verifying an existing flange design, the vessel design requirements (pressure, temperature) and the physical parameters of the flange (ID, OD, knife-edge seal detail, the bolt pattern and bolt material, the parameters of the seal material) are used to determine the required thickness of the flange. Correct selection of the gasket parameters (Table 2-5.1 and Table 2-5.2 of Appendix 2) is critical to correct design. As a general rule commercial conflat type flanges are found to be suitable at pressures below 50PSIG. Above these pressures alternation to thickness or bolt patterns are required. Another issue that often determines whether a commercial conflat type flange may be used is the required size of the welds connecting the flange to the pipe or tube. Welds required by the ASME Code can be much larger than those typically seen in vacuum applications. These welds can distort the flange knife-edge seal making it unusable. In such cases a custom knife-edged flange with post weld machining of the seal surface will be necessary. Conflat type flanges have found widespread use in scientific equipment. It is one of the few options available in a demountable seal that will remain vacuum-tight when cycling to cryogenic temperatures. It is not a simple matter to use a commercial conflat type flange on an ASME code stamped vessel, but it may be possible under certain conditions. If the combination of pressure and flange diameter becomes too large then a commercial conflat flange will not meet code requirements. ASME Code required weld design may cause unacceptable distortions to the knife-edge seal detail of a conflat type flange. With a custom flange design, it is still possible to retain the knife-edge seal detail and use a standard conflate gasket.